Howdy faithful readers! 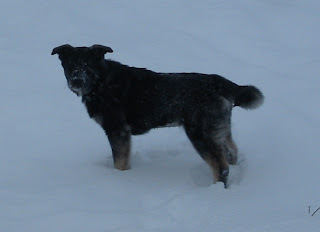 Sorry for the delay, but's it's been SNOWING like crazy so we've been sticking close to home. We've managed to get most of the insulation up in the tent and it's making a serious difference! We've about roasted ourselves out of the tent on a couple of occassions. Of course, Charlie loves it when it's 90F inside... sure beats 50F! Of course, the snow lightened up enough today for me to venture into Manley for mail and laundry, but now it's coming down hard again. Oh well, I can just drive even slower on the way back LOL! As you see by Charlie's post (poor baby hasn't figured out that we aren't connected to the internet and I have to post her missives for her) we have a new puppy. Her name is Ripley and she's a little over 3 months old. 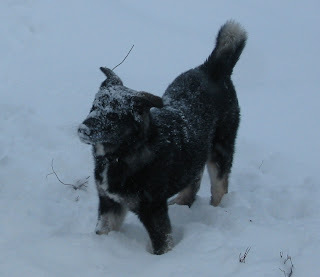 She's an Akita-Malamute mix, which makes her an excellent choice for the winters up here. She absolutely loves running in the snow, loves digging in the snow, loves rolling in the snow, and especially loves eating the snow. She's also going to get to be about 120-150 lbs, which will make her a formidible guard dog out here in bear and wolf country. She loves people and is a good house dog, even though (being a puppy) she eats everything. Keep posting. I'm loving reading about your adventures. You make even your hard work sound like it's almost fun. Love your sense of humor! A puppy! Now that's going to add some entertainment to the winter. 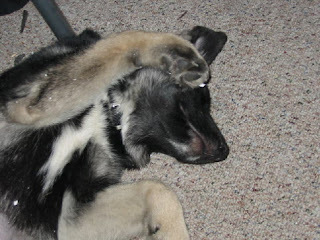 We have one too and so I have an idea of what you're going through with the chewing and rammy antics. Yours already looks huge for her age. I wonder where you're going to get all that dog food for the next few months. Keep up the great blog and stay safe and healthy! I hope G's leg is all healed up now.